The workshop on IPRs in mobile internet, on 18th July 2014, was hosted by the Institute for Internet Policy& Law of BNU. Professor Xue Hong, Director of the BNU Institute for Internet Policy& Law, moderated the event and Professor Jorge Contreras from Washington Law School of America University, Sunil Abraham, Director of India Center of Internet and Society (CIS), Nehaa Chaudhari, the Senior Researcher of CIS, and the other researchers joined the workshop in person or remotely and gave the presentations. Prof. Xue gave an overview of the research project and introduced the the member and status of the Chinese team. The project on mobile internet addresses the rights, obligation, and liability of the stakeholders involved in the mobile Internet, including the software/ hardware providers and right holders, and attempt to improve intellectual property norms on mobile Internet. Two Chinese team members presented their preliminary research respectively. 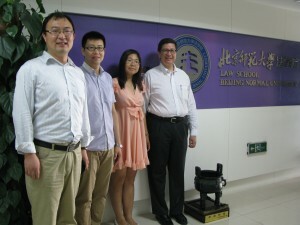 Mr. Leo Liu, Attorney and Patent Agent at Beijing L&S Intellectual Property Law Firm, briefed the patent disputes and recent lawsuits regarding mobile Internet. Mr. Handong Wen, PhD student of BNU Law School, briefed copyright protection on mobile internet. Ms. Nehaa made the comments on the presentations. The Chinese team discussed the implementation timelines, work methodology and regular communications with their India peers. Both Parties were pleased with the consensus and progress made so far and committed to purse the research in close collaboration. For the report in Chinese, please visit <http://www.bnulaw.com/cn/detail.asp?ProductID=39480&CategoryID=607>.